The Illinois Observer condenses the case to re-elect Ron Sandack for State Representative in the 81st House District into a short, but powerful paragraph. Our support of Sandack has been documented many times over. Not only do we think that he's facing a TOTALLY unnecessary primary against Keith Matune based purely on one very important vote, we think that if the ILGOP is to survive - and fourish - we need a lot more Ron Sandacks' down in Springfield, not less. GOP Primary: Keith Matune v. Ron Sandack. The choice in this contest is clear. State Rep. Ron Sandack (R-Downers Grove), a former Downers Grove mayor, is a genuine rising star in the House – and Illinois politics. Sandack’s blend of intelligence, enthusiasm, moderation, and deeply conservative fiscal credentials not only qualify him for second term in the House, but also position him to be a viable, future candidate for governor. If Republicans are to ever exit their minority status in Illinois, Sandack serves as their role model and his record as their road map. 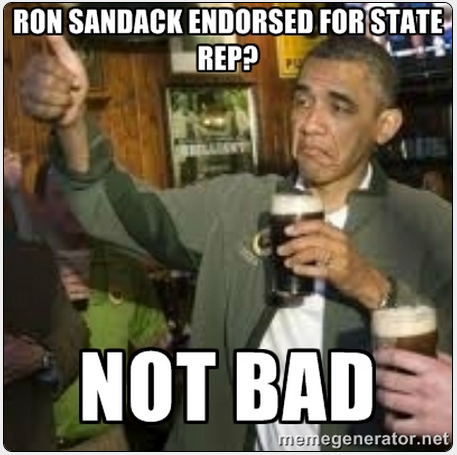 Sandack is enthusiastically endorsed. We agree completely with the endorsement, but the Governor's Mansion for Sandack? We'll see. Let's think about something like Illinois Republican Party Chairman first where he can revitalize the party and bring more voters into his 'big tent'.